Guys everything feels so surreal right now! Last week I went wedding dress shopping with my mama. This was my very first time trying on wedding dresses so I was just radiating with excitement! The best part was, Essense of Australia actually gave me the unique opportunity to go in store at a location that sells their dresses and let me take a few off property to shoot some pretty cool photos! Today I will be sharing all about my experience trying them on and although I will not be sharing any details or photos of THE dress, you’ll get to see me wear a ton other gorgeous gowns from Essense of Australia! I went to Wedding Studio Greenwood on the hunt for the perfect dress. This experience was such a dream! Andrea was the consultant that helped us out and help me find my perfect dress. She was the kindest soul ever and was so accommodating! As soon as I got there I was overwhelmed by how many gorgeous dresses there were! I was not expecting to literally love every single one that I saw! I love Essense of Australia dresses because most of them have really nice lace detailing and long trains! When looking for my dress, I really wanted something to be boho and feminine with maybe a slight vintage vibe. I’m definitely a mermaid dress kind of gal so that was an important aspect that I wanted to have in my dress that I chose! Overall though, I wanted to go in with a very open mindset and did not want to shut out any possibilities too quickly! Here are a few of the dresses that I tried on & what they looked like! Quick fun fact before we jump in: the first dress that I tried on was THE one! (lol) They said that actually happens a lot! The first one you pick is usually one of your favorites and sometimes ends up being the dress for the real deal! The second is I tried on was a super feminine lace dress with a really cool graphic lace and my favorite part about this dress was the beaded sleeves. I thought this added a really cool vintage feel and vibe to the dress! There were so many others that were beautiful as well. I tried sleeves, strapless, cap sleeves, we did it all! You can look through the photos below to look at the ones I tried on. I was blown away by how amazing each dress was! I honestly think I could’ve been happy with any of the ones I tried on, there wasn’t a single dress that I didn’t love! Essense of Australia has such great quality dresses. One of my fears when shopping for a dress was having the dress look awkward or not fit in my chest area because I’m on the chestier side. Usually that is what makes or breaks dresses for me when I try them on just because my bust to waist ratio is pretty extreme. BUT I was so pleasantly surprised to find that the dresses from Essense of Australia actually were cupped and looked gorgeous. It fit in all the right places. One dress that really tore my heart was this long sleeve dress! Originally when I thought about getting a dress I was set on something long sleeve. I wanted something very Boho and unique but I also did not want it to look formal at all! I am getting married in June so honestly a long sleeve dress in the hot Indiana summer just seemed like it was setting myself up for failure. So, I had to pass on this one but gosh was it so hard to say no! This dress was just gorgeous & since I couldn’t where this one on my big day, I chose this one to take off property to shoot some photos! We shot in the middle of the field. I loved adding the hat to the look, I thought it made it fun! 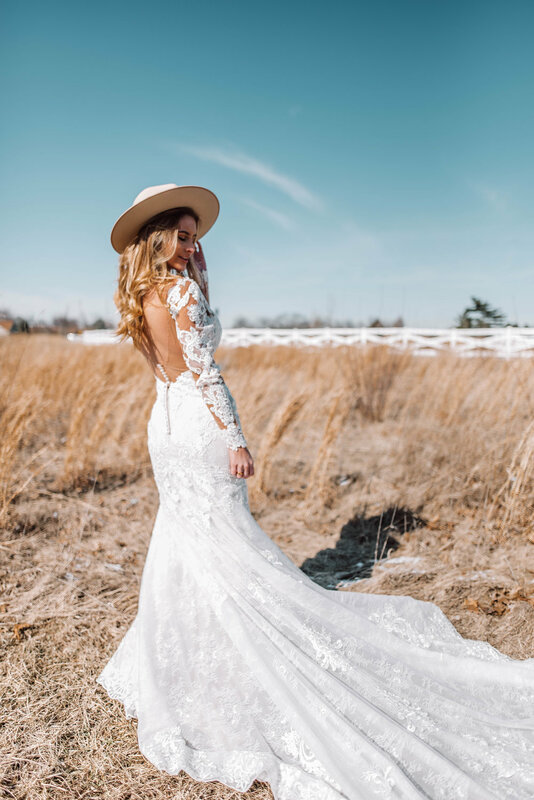 The second dress I took off property was more of an A-line strapless dress: two things I actually knew I didn’t want on my big day. I actually ended up loving it so much when I tried it on though! For me I did not want a strapless just because like I said, I’m chesty girl and I don’t want to deal with keeping the girls up all night long LOL! Plus I want to show off my curves and so an A line just didn’t seem like my first choice! However, let me tell you, this dress was so unbelievably gorgeous! The detailing and the movement that the skirt gave was just phenomenal! This dress photographed so beautifully and I think it would look great on anyone! And the last dress that I shot outside was actually the second dress I tried on with the beaded off the shoulder straps. This one was also one of my favorites and so I wanted to capture this one in a more unique setting! The graphic lace on this dress just blows me away! I love all the details on it including the sleeves I think this dress would be super unique and fun for anyone looking for something a tad bit different on their big day! With Essense of Australia you are getting a high quality gown. They feel very luxurious and were super comfortable to wear! I loved my experience trying on wedding dresses for the first time! It was such a special moment to me. You can actually use this tool on their website to locate where you can find their dresses in bridal stores that are closest to you! If you are local, I recommend going to The Wedding Studio in Greenwood! Their shop is filled with such a great selection of dresses and Andrea was such great help! If you do head to that particular store make sure to ask for her because she was just a sweetheart! I’m so thankful that she could be a part of such a special moment selecting my dress for my wedding day! Love you all so much and thank you for following me along on my journey!